For many, travelling for business or for pleasure is part of our lives, whether commuting by car or flying by plane. Travelling can be disruptive to the usual daily planning of meals and sleep, and with diabetes this can become more of an adventure. Although it will require a good understanding of how to manage supplies, with proper preparation, diabetes should not restrict or discourage anyone’s wish to travel. “I love to travel. We go somewhere at least once a year. Since using the insulin pump, we have gone to Mt Everest base camp, I’ve climbed Mt Kilimanjaro... Having a pump helps with all of that, so I can adjust my dosages to what I’m doing on any given day." When travelling, adjusting to changes in your normal activity, such as eating and sleeping, can be easier with the use of an insulin pump. Managing delayed meals, skipped meals or diverse diets when travelling may be difficult. An insulin pump can make food management and blood glucose control easier and more flexible when you travel. Indeed, the insulin pump allows you to adjust boluses for meals that come at odd hours, taking many small boluses for snacks, or for taking correction boluses when you’re unsure of the carbohydrate content of new foods. And since it is possible to use a pump whilst flying on commercial air crafts, you can go wherever your heart leads you. 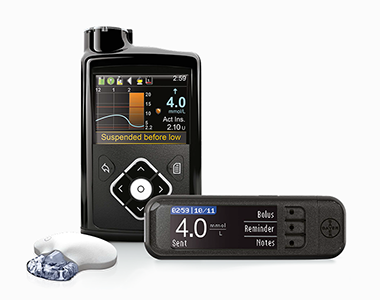 Learn more about the MiniMed® 670G System and Insulin Pump Therapy. To learn more, check out these travel tips from Diabetes Australia or hear lifestyle and exercise stories from real patients.